The Weald Bethel Food Pantry in Cherryfield. PORTLAND, Maine — The stats are well-known: About 16 percent of Maine households struggle to put food on the table, and the state ranks third in the nation for hunger. Now a new report lays out why food insecurity persists in 2017. The comprehensive study released Thursday by the Good Shepherd Food Bank and Portland’s social work agency Preble Street reveals where hunger is most persistent, who suffers the most and why 200,000 Mainers often cannot find enough food. The 27-page report, called “ Hunger Pains: Widespread food insecurity threatens Maine’s future,” is the result of a 2,000-person survey compiled by food pantry recipients across the state in July, with the help of the University of Southern Maine. Its architects hope the data-heavy report can be used to make legislative changes to reverse the chronic trend. “Through analysis, we have unrefuted data showing that people are using pantries more this year than last year,” said Kristen Miale, president of Good Shepherd Food Bank, speaking at a press conference at Project Feed in the basement of Woodfords Congregational Church. — 87 percent of households seeking assistance include a child, a senior or a person with a disability. — 56 percent of those surveyed use a food pantry at least once a month. — 59 percent used food pantries more this year than last. — The three most populous counties have the largest numbers of Mainers facing food insecurity: 40,330 in Cumberland County, 27,590 in York County and 25,280 in Penobscot County. Loss of Supplemental Nutrition Assistance Program benefits and low wages are major culprits, the report found. 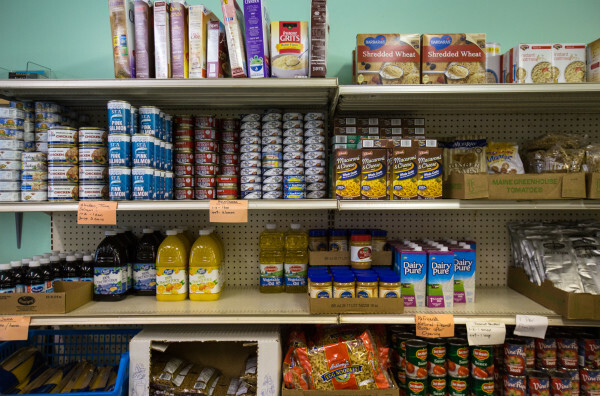 Recent state policy changes, such as enacting a three-month time limit, are forcing people off food assistance before they can get back on their feet, according to the report. The report reveals structural causes of food insecurity, according to Michael Hillard, economics professor and executive director of the University of Southern Maine’s food studies program. Employment growth in southern Maine has been strong, but the combination of low wages and rising rents makes it more difficult for many people to feed themselves, the report found. Standish mother Orianna Bennett works as a cashier for $9.25 per hour and said she worries about her child’s future. Her husband has an illness that recently forced him to stop working. To her the report is a key step toward solving hunger here. “It’s vital for his future to have food and not have to worry about it,” she said about her 16-year-old son. Last summer Gov. Paul LePage threatened to end state control of food stamp program because the U.S. Department of Agriculture wouldn’t allow Maine to restrict food stamps from being used to purchase sugary foods and drink. “We are hoping that this speaks to the Legislature. We truly believe that all legislators are here to serve Mainers. Changes in how SNAP is being administered at the state level is preventing people from getting back on their feet,” Miale said. The report lays out policy recommendations such as protecting, restoring and bolstering SNAP childhood nutrition programs in schools; investing in job training and transportation for low-income Mainers, as well as affordable housing; and expanding health care coverage. Jim Hanna, executive director of Cumberland County Food Security Council, called this moment crucial. To Miale the report has the power to change the misconceptions of people in the food pantry lines.